As far as our Michelin-star dining adventures go, they all began at L’Atelier de Joël Robuchon in London. The two-Michelin-star restaurant near Covent Garden is one of legendary French chef Joël Robuchon’s many restaurants that span the globe, including Singapore. In the run up to her arrival in London to spend the Christmas holidays with me in December 2011, I came across L’Atelier de Joël Robuchon off Timeout London and promptly made a reservation. It was the early days of our dining adventures then, when we were just riding on our previous experiences of Jamie Oliver’s Fifteen and Gordon Ramsay’s Foxtrot Oscar which were far from Michelin standard. In fact, while we had heard of Joël Robuchon then, we were actually unaware that this particular restaurant was Michelin-starred. It was only days later that we found out. I had sheepishly shared with my fellow Singaporean student friends there that we had dined at the restaurant that one remarked in jest at our indulgence at the two-star restaurant. Anyway, the restaurant is located in a lovely sanctuary of an area that is away from the Covent Garden crowd. 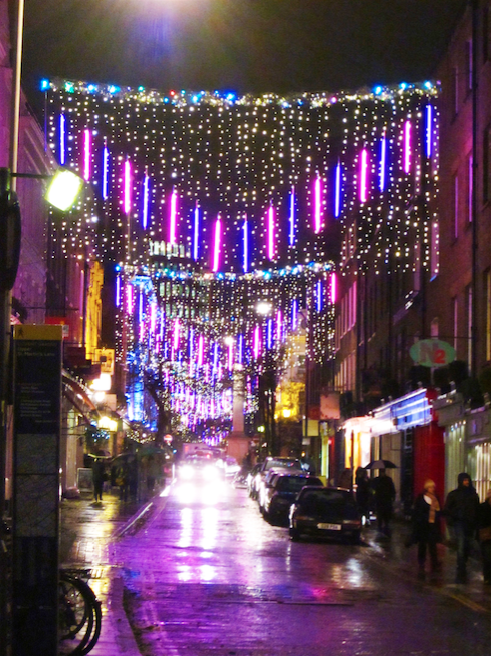 As we made our way to the restaurant, we were treated to beautiful sight of streets all decorated for Christmas. 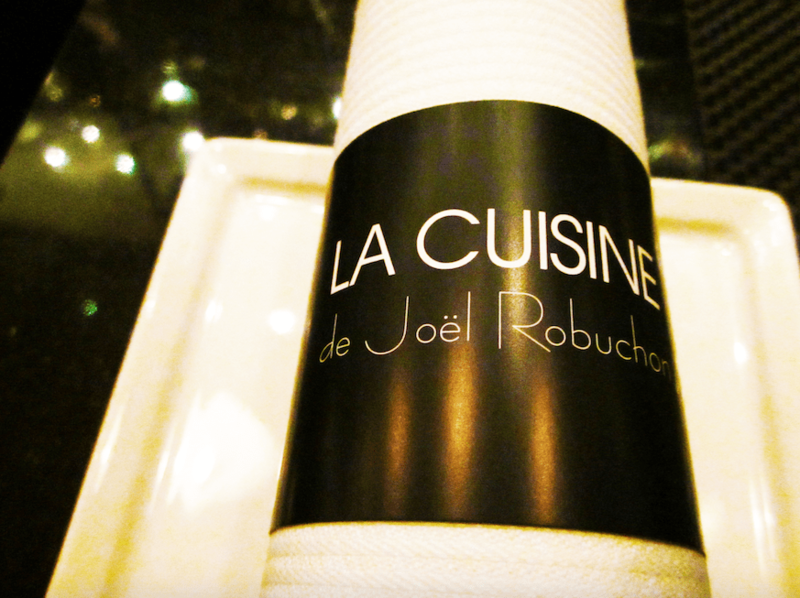 We were seated at La Cuisine de Joël Robuchon situated at the first floor of the restaurant. It had a stylish interior with a black and white theme and an open kitchen. There was a friendly atmosphere, which made the the experience very fun. Fine classical French cuisine is served at the restaurant, hence traditional ingredients such as foie gras and duck featured on the menu. We ordered off the a la carte menu, sharing a foie gras with toast starter. Our mains were a dory dish and the chef’s special duck leg. After finishing our mains, we asked our friendly waiter for the dessert menu and he, with a straight face, told us that they were out of dessert that evening. When the disappointment began to show on our faces, the waiter cheekily whipped out the dessert menu and handed it to us. We had the le chocolat tendance and la tarte gourmande for dessert. Two yummy surprises were served – a foie gras with berry paste pre-starter and a delicious special sorbet covered in frozen white chocolate pre-dessert. We had a fun experience at L’Atelier de Joël Robuchon. However, we do also feel that while the food was well-prepared and yummy, the starter and mains lacked a certain level of innovation and imagination for a restaurant at this level. Perhaps this is symptomatic of serving classical French cuisine which restricts creativity. The surprises and desserts hit the right notes nevertheless. We also found that the price of our meal was reasonable compared to the insane prices charged at the Joël Robuchon restaurant in Singapore.